Today is only Monday and I feel SO hungover from Halloween! We packed in so many activites over the weekend! Grandpa's company had a fun company picnic, this horse was so friendly! Miss M and grandpa playing some mini golf. She didn't quite get the rules! A few meltdowns, of course. 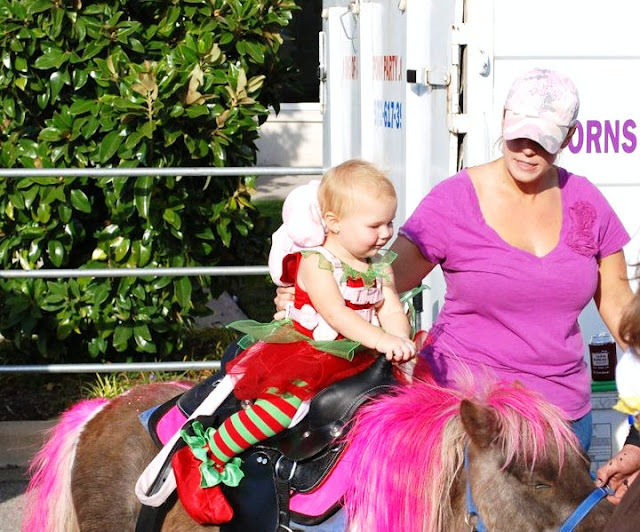 Went to a Fall Festival and it was WAY too crowded so we did the pony rides and left. She love it once we got going though. Even with her stranger danger phase going on she LOVED trick or treating!! Her stash that I'm sure Daddy is going to eat! I can see why you’re tired! Looks like a fun and eventful weekend. Love the last pic....too funny! Cute pictures. Love her costume! PRECIOUS! That photo of her surrounded by her candy is priceless! Glad you guys had a great weekend (and glad to hear the pups okay! She is the cutest little strawberry EVER....I am lovin her strawberry shoes!! oh my goodness, how cute! Looks like you guys had a jam packed weekend! Rain Rain go freaking away!